JA: How did the Sirens Big Band first form and how did you become a member? 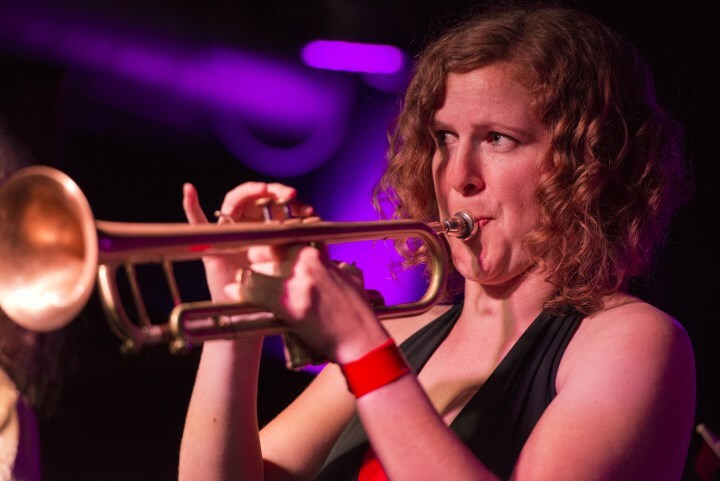 EK: Sirens was formed in early 2010 by Jess Dunn and Harri Harding, who had done the Young Women’s Jazz Workshops for a few years and decided it would be a great idea to form a band with some of the women they’d met through the workshops, and other women jazz musicians around Sydney. That year Jess and Harri received the Jann Rutherford Memorial Award, which helped get the band up and running. The purposes of forming Sirens were to address the gender imbalance in the jazz community by breaking the stereotype of big bands made up of mostly (if not all) men, to create a community where women didn’t feel like the odd ones out and to help us all improve as musicians. I was contacted by Jess, who had heard about me through my past teachers Sandy Evans and Judy Bailey, about joining the group, and it sounded exciting so I said yes. It’s been quite a journey from January 2010 until now. We’ve come a very long way and are doing many exciting things! JA: You have written a number of suites, notably the “The Mieville Project”, which premiered at the 2015 Sydney International Women’s Jazz Festival – what attracted you to this musical format as a composer? EK: The first suite I wrote was Theseus and the Minotaur in 2012. The idea for this was sparked when I was revisiting Jeff Wayne’s War of the Worlds which I’d listened to (and been a bit freaked out by) as a kid. I had been looking for a cool idea for a project to do with the funding from the Jann Rutherford Memorial Award, which I won that year, and decided that writing an extended work of music to go with a narrated story would be a fun, challenging and unusual project. Another thing that interested me about doing this sort of project is the relationship between storytelling and improvising. I was excited by the idea of having the musicians interpret the story in their own voices in the sections with improvised solos. I found the challenge of expressing stories and describing scenes and concepts through music allowed my imagination to get outside the sorts of things I had written in the past, and I liked where that took my writing. I like the format of music suites because they allow me to write in such a way that the focus is shifted away from individual musicians and their solos, to the work of art in its entirety; the individual voices are still clear and important, but play specific roles in the whole journey of the work. I have also found it very effective having narration to contextualise the music, and have had a lot of good feedback from audiences telling me they felt really immersed in these performances. My new suite [A]part will not include narration, however there will be projected visuals to enhance the mood and abstractly give context to the music and its thematic material. JA: What has been the inspiration for the latest work , ‘[A]part’, that Sirens will soon perform in concert? EK: The suite expresses my reactions to the massive global issues of climate change, the refugee crisis, and the effects of the internet on individuals and society. It’s not my wish to persuade people how to feel about these issues, nor do I have answers to our problems, however I do hope that my music will speak to listeners in some way, hopefully compelling them to stay emotionally connected with what’s going on, and driven to keep striving and overcoming apathy and complacency, as it seems that these days we can easily begin to feel overwhelmed and defeated. JA: It’s an unusual name – can you explain? EK: There are many meanings behind the title [A]part. It’s a comment on the various relationships myself and the society I live in have with climate change and the refugee crisis and how the internet influences our perspectives on those issues. For instance, due to the accessibility and speedy spread of information through the internet, I can easily feel like I am part of a global community – like I’m connected and know what’s going on through reading articles, watching videos and having conversations online. However, physically I am still apart from the people who are affected by war, famine and natural disasters, and I also don’t know what it’s like to live through those struggles; in reality I will read a story, feel shocked and sad for a little while, but then I will read something else minutes later, or go back to my life where I am safe and have everything I need. Another example is Western society’s connection to, and disconnection from, climate change. Through greed and short-sightedness we have caused immense damage to the Earth, however because we are well off, we don’t feel the effects as much as people in poorer countries, and many of us are able to turn a blind eye because it’s more convenient for us that way. JA: What was the process in writing this suite and how long did it take? EK: [A]part took me about 11 months to write. Last year I received a grant from the Australia Council for the Arts to study composition with one of my favourite musicians, the extraordinary Barney McAll. I had my first lessons with him down in Melbourne in July, and that’s when the first ideas started to form. Hearing him talk about how he thinks about music and about the process of composing, particularly how to find the initial seeds of ideas that grow to form pieces, as well as some of the amazing music he showed me, was really incredible. It really felt as if he had given me the key to a part of my brain that I hadn’t known existed, and I opened the door and inside was a massive heated indoor swimming pool with colourful lights shining through it and weird ethereal music playing, and also smoke machines because smoke looks great with colourful lighting. No but seriously, my little mind was blown. Many of the themes in the music came to me at times when I was experiencing strong emotions. Barney encouraged me to “tap into” these experiences to find ideas. For instance, I had to move house in August last year and it was a mammoth task as I had so many other things happening in my life at the same time. One night I was lying in bed with my thoughts churning constantly and I was feeling very anxious, and a little melody popped into my head. I repeated it in my mind enough for it to become a clear idea I could sing, then grabbed my phone and recorded myself singing it. A month or so later, when life was calmer, I developed this theme into a section of the suite that’s about the refugee crisis. My thoughts were, if that’s how bad I felt having to move house here in Australia where nothing very bad could happen to me, how must it feel to have to flee your home from danger, and not know where you could go that would be safe? So, through developing that melody, and tapping into the anxiety I had felt at the time, I wrote a piece of music which expresses how I imagine it might feel to be someone experiencing that sort of struggle. Over the 11 months it took to write the suite, I would write sections of music (their initial ideas usually sparked in a similar way to the above example), show them to Barney for feedback, and then go and make adjustments according to his suggestions. All the while I tried to keep in perspective the entire piece as well as the small section I was writing, and the way all the sections related to each other. Another thing I did, at Barney’s suggestion, was blu-tack paper on my wall so I could write down and map out the music and what it was about as I went, including ideas and themes as they came to me, and the actual written music itself, as I wrote it down on manuscript from finding ideas on the keyboard, or as printed snippets off Sibelius, the notation program I use. JA: You have attracted some wonderful soloists to join the orchestra for this performance – tell us a little about them. 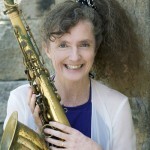 EK: Dr Sandy Evans OAM is an amazing saxophonist and composer from Sydney. She is an expert on Indian music and many of her projects combine jazz and Indian music in incredible ways. She has been a driver behind many initiatives to help even up the gender balance in jazz in Australia. She has had a huge influence on me, and been a mentor to me since I was 18 and did the Young Women’s Jazz Workshops. I really owe a lot to her for where I am now. I first saw pianist Andrea Keller play at Wangaratta Jazz Festival with her quartet in 2007, and I loved her music instantly. The album she had just released, entitled Little Claps is still one of my very favourites. Since that gig my admiration for her has continued to grow. I find her playing and compositions beautifully haunting and unique, and clearly I’m not the only one who thinks this, as she has won many many prestigious awards for her diverse, adventurous projects. Gian Slater is unlike any vocalist I’ve ever heard, and when I first heard her sing with Andrea’s group at the 2012 Sydney International Women’s Jazz Festival, I was really blown away by her pure, liquid voice and amazing improvisations. She’s highly sought after, has many amazing recordings and accolades under her belt, and many projects of her own, featuring her beautiful compositions in a variety of contexts, from intimate duo albums to her incredible vocal ensemble Invenio. I’m immensely stoked and humbled that these three musicians, some of the very best in the country and certainly great influences on me, have agreed to play my music and I can’t wait to hear what they will bring to it. JA: You are also incorporating visuals by a video artist – what’s the story there? EK: We’re really going all-out! When I first started talking about my ideas with Barney he suggested that it would take things to another level to have visuals with the music. There are many reasons behind this. As I mentioned earlier, I’ve found it’s great to put context with my music, to make it more immersive for the audience, so this time, instead of narration as I’ve used in the past, the visuals will provide that. The visuals will be abstract and mood-enhancing. Again, I don’t want to tell people what to think, by showing them documentary-style footage, but rather to have subject content only barely hinted at, so the audience’s imaginations can go where they want. Also, all along I have strived to take this suite outside of the realms of what listeners might expect to hear from a big band. Having these visuals helps to achieve that. They are being created by the very creative local talent Cleo Mees. JA: I believe you consider this one of your most musically challenging pieces. How does the orchestra prepare to meet that challenge? EK: Lots of practice and rehearsing! When I finished [A]part in June and sent out all the charts, I also sent out mockup recordings that are a mish-mash of computer-generated midi sounds, recordings of a preview version of the suite we performed earlier this year, and recordings of myself playing through my computer’s dodgy inbuilt microphone. Though they don’t sound amazing, they are useful to practice along to so that everyone can get familiar with the music outside of precious, limited rehearsal time (it’s tough getting an entire big band together for rehearsals!). JA: Where do you see your composing career heading in the future? EK: Hopefully many many rich people who love to commission new music works will hear my music and love it and want to pay me lots of money to write more! Ok maybe that’s unrealistic. I’m sure I will continue to create more music projects involving my compositions for various different types of groups, long into the future. I certainly love composing and can’t see myself stopping… probably ever. I think it’s a need I have. JA: What can audience members expect when you perform these two concerts at UNSW on Saturday 5th August? EK: Not your average big band gig. Unpredictability. Diversity. A journey. Weirdness. A strange mix of genres including, but not limited to elements of; metal, afrobeat, jazz, klezmer, Brazilian… and other stuff that’s hard to define. Beauty. Rage. Determination. Amazing soloists. Before Sirens plays [A]part there will also be a short set by the fantastic Young Women’s Jazz Orchestra – an initiative set up last year by Sirens for talented late high school and early university students to give experience and skills to help them in their post-school journeys towards being professional musicians. feat: Andrea Keller, Gian Slater and Sandy Evans.